Wild olive wood is a preferred carving medium of Kenya's Kamba wood carvers. With extreme precision, these talented artisans draw beautiful serving pieces from the rich grain of this East African hardwood. 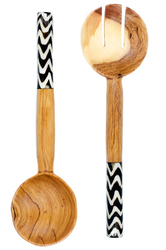 Wild olive wood salad servers add natural beauty to the tabletop and season well through the years.